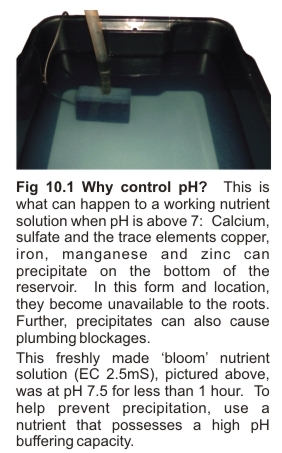 The key reason for controlling the pH of nutrient solutions is to make sure that the individual elements in the nutrient remain soluble. If certain elements become insoluble, a white precipitate will form on the bottom of the reservoir. Depending on the pH, this precipitate may take several hours to form, or even days (Fig 10.1). a) The individual elements remain dissolved in the water and are therefore available to be pumped to the root zone - unlike Fig 10.1.
b) The individual elements are in a soluble form which roots can readily absorb (Fig 10.2). pH values above 6.0 are to be avoided more than low values such as pH 4.5 to 5.0. All essential nutrients are soluble at these lower pH values. The precise pH at which calcium and sulfate begin to precipitate is determined by their combined concentrations. Except for fertilizers ‘low’ in calcium and sulfate, this problem commonly occurs at ~pH 6.5 when the net* EC is ~2.5 mS; or ~pH 7.0 for 1.5 mS solutions. As a general rule, to avoid precipitation, higher nutrient concentrations must be held at lower pH values. *Assumes make-up water has nil EC. Although this is a popular recommendation, it has no scientific basis. It appears to have gained ‘mythological’ status from the early days of hydroponics when the only cheap means of measuring pH was the common ‘bromothymol blue’ pH indicator used for testing fish tank water. Interestingly, the lowest pH value able to be determined by that indicator is about 6.2. It would appear that this value has unfortunately become an entrenched recommendation in some sections of the hydroponic industry.